In May 2018 our Japanese Chapter and the Japanese Association of Groundwater Hydrology (JAGH) co-hosted a joint seminar “Alpine Hydrogeology: The Critical Role of Groundwater in Sourcing the Headwaters of the World” at the College of Humanities and Sciences, Nihon University, Tokyo. Ninety-seven participants attended. The seminar featured guest speakers Prof. Dr. Masaki Hayashi, University of Calgary, Canada, and Prof. Dr. Keisuke Suzuki, Shinshu University, Japan. Prof. Hayashi gave the NGWA Foundation’s 2018 Darcy Lecture, discussing the importance of mountain area to hydrological cycle of the world and effects of climate warming on mountain hydrology. He also gave guidance to the students and early career professionals about how to better promote research activities. 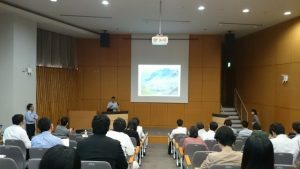 Prof. Suzuki talked about the current status of alpine hydrogeological studies in Japan, describing characteristics of the Japanese mountain area and its importance to local and regional hydrological systems.